How good (and how successful) is your content strategy? Only 12% say they create content with specific customers, targets, markets or industries in mind. Only 11% feel the organisation is highly effective, developing purpose-built content that keeps audience and business goals in mind when outlining content, format and distribution. These two go together. Most businesses agree that ‘we need a blog’. Or ‘we should have some white papers for download.’ But too often the next step is a scramble to see what content is available, rather than what content would be best. And it goes without saying, you can’t work out what content is best if you’re not clear what your target market is. Key learning 1. Invest time and effort upfront to develop a content strategy and a content plan. Details of the plan or editorial calendar will change over time. Change is the only certainty. So take time to step back and review the actual content against strategy every 6-12 months. When it comes to delivering great leads, content pieces typically associated with thought leadership (ie non-sales-related content) rise to the top. Key learning 2. Step back from the need for a quick sale. Support buyers early in their research process with general information. This can be links to industry reports or websites, or an in-house overview of something key to your industry. Or try a decision template to help buyers determine needs. Help buyers at this stage, and you open a door. Push for a sale, and they may slam it in your face. Only one in four is actually developing specific content designed for lead nurturing. Why’s that important? 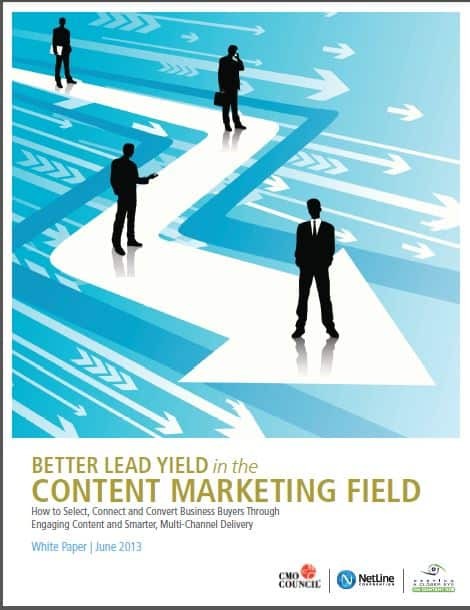 The report notes that ‘the majority of senior B2B buying executives (86%) indicate that content plays a critical role in add-on buying decisions or supplemental purchases’. This is a modern take on an old issue. We all know that it’s harder to get a new customer than retain an existing one. More expensive too. Yet we still tend to focus on new customer acquisition. The same story is playing out in content strategies. Key learning 3. Don’t limit your content strategy to lead and customer acquisition. Develop strategies to retain, nurture and grow your existing customer base as well. Marketers are relying heavily on owned channels like corporate websites, email to known databases and social media promotions. For the most part, these channels are delivering moderate results. It’s called ‘talking to the converted’. At best, the partially converted. There’s a whole world of potential customers out there who don’t know about you yet. How are you reaching them? Key learning 4. Your content marketing strategy needs to consider content promotion just as much as content creation. Only 2% of respondents feel they have a highly effective demand generation strategy that delivers high-quality leads. At first sight, it’s an incredibly low number. But it actually flows on from the last point. Only the handful of marketers who have both great content and wide content distribution are likely to be ‘highly effective‘. Key learning 5. Look at your content strategy overall, identify the gaps. Then fix those gaps as your top priority. Unlock the value of what you already have. Do you face those these challenges? Or is something else a sticking point for your content strategy? If you’d like to discuss your particular situation, contact NoBull for a no-obligation chat. You can also check out the infographic below or download the full report.